It’s true that applying earlier is better. 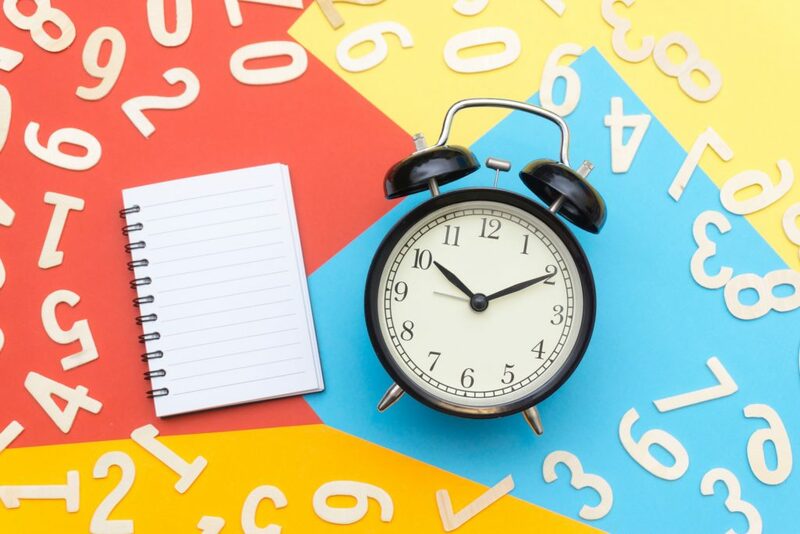 Most law school admissions committees consider applicants on a rolling basis, and at the beginning of the cycle, they have more open slots. We know from both experience and data that you can improve your odds by sending your application in earlier. But timing isn’t the only thing that matters. It’s also critical that you turn in a squeaky-clean application, one that follows all instructions to the letter and contains no typos or larger errors. Every year, people send customized essays to the wrong schools, misspell the names of deans or professors, check the wrong box in response to character and fitness questions, and make numerous other errors. Waiting a few extra days before you submit will have no impact on your chances of admission. Using those few days to check for mistakes will have a gigantic impact. Our basic advice is to chill. We know you’re itchy. You’ve worked on your applications for months, and you want to send them in right now so you can beat the latest wave of submitters and hear back sooner. But if you act rashly, you can mess up all those months of hard work. Slow down, and make sure your application checks all the right boxes. Go to your application on LSAC.org. 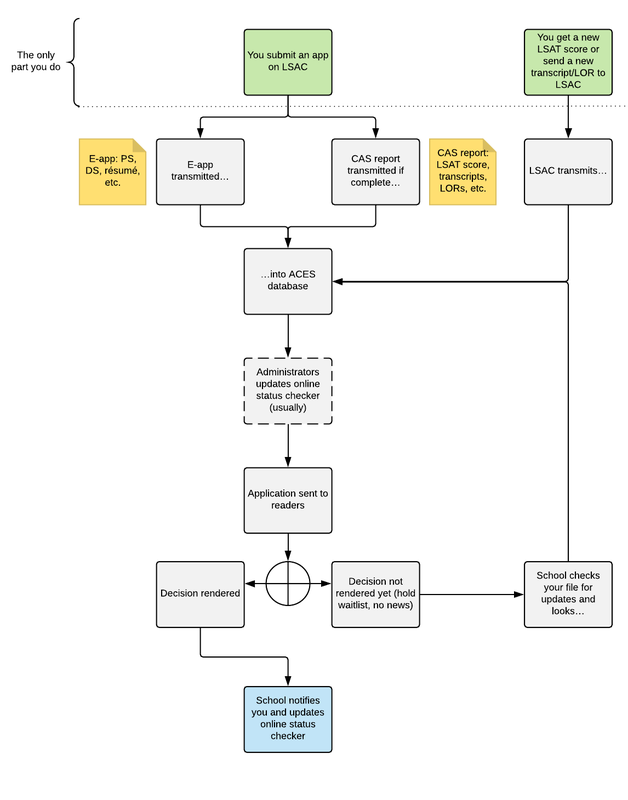 Click “Review Application (PDF). Note that the preview shows you what admissions officers will actually see when they review your application: a long-scrolling PDF. After you submit your application, LSAC transmits two packets. First, they transmit your e-app, which consists of everything you just saw in the PDF preview: your personal information, answers to all other questions (such as character and fitness questions), and your attachments (personal statement, résumé, etc.). At the same time, they’ll submit your CAS report if it’s complete. Your CAS report consists of your LSAT score report, academic summary, transcripts, recommendations, and some other information. In other words, the e-app includes everything you fill out or upload on a school-by-school basis; the CAS report includes everything that LSAC warehouses for you. Your application goes into a system called the ACES database, where schools can access it electronically. Most schools will email you a link to an online status checker, and someone on the school’s administrative staff usually updates your status checker when the school receives your application. After that, the application goes into the black box of the school’s admission process. The school may assign certain kinds of applications—e.g., high-LSAT applicants, diversity applicants, or international applicants—to certain readers, or it may assign a mix of applications to each reader. Each school has its own process, and these processes may change every year. 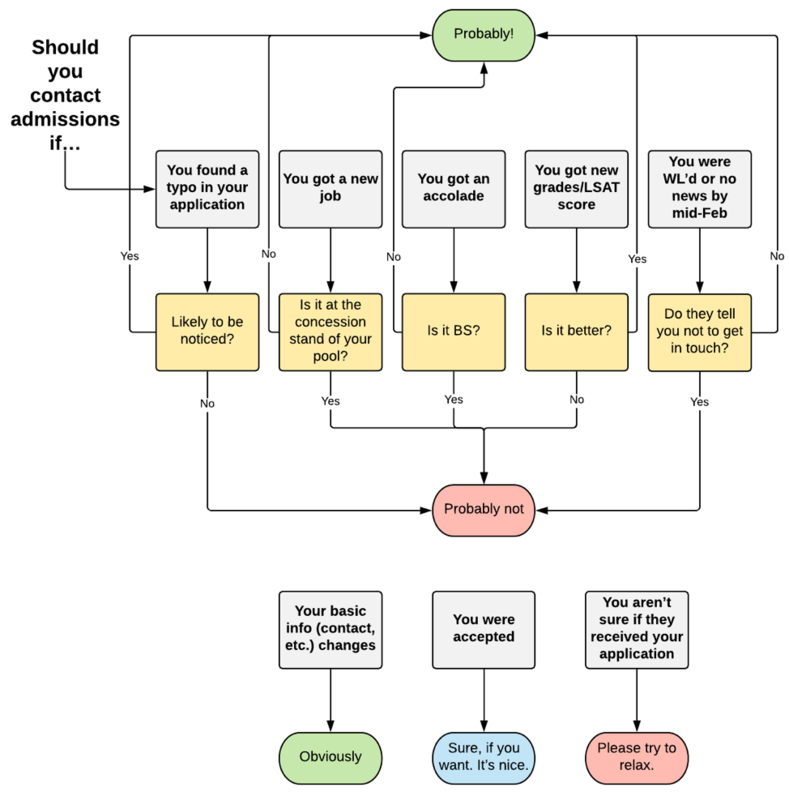 Don’t try to figure out a school’s process and adjust your application accordingly. Just submit an application that tells a compelling story about who you are, why you want to go to law school (maybe), and why you’re likely to succeed or contribute to the class (probably). The admissions committee will either make a decision and notify you or decide to punt. Often, admissions officers want to continue observing the behavior of the applicant pool before they make a decision. In such cases, they may notify you that your application is on hold, they may waitlist you, or they may not notify you at all. If you (1) retake the LSAT, (2) send a new transcript to LSAC, or (3) assign a new letter of recommendation to a school via LSAC, then LSAC will transmit that information into ACES and the school will see it. If you send an email to the office of admissions, someone on the school’s administrative staff will put the email in your file. Admissions officers will review all such updates when they return to your application later in the cycle. Who hears from law schools first? Applications are time-stamped, but they aren’t necessarily read in the order they’re received. Some admissions committees may prioritize applicants with certain LSAT/GPA pairings, for example. The applicants who tend to hear earliest in the cycle have a high GPA and LSAT score (relative to the school’s medians) and a highly relevant background: for example, they did Model United Nations or worked for a year as a paralegal. It also helps if the applicant seems likely to matriculate. If you don’t live at the nexus of that Venn diagram, don’t despair. You really shouldn’t read anything into a law school’s silence. Nor should you put too much stock into what you see on your status checker unless the checker actually gives you a decision. 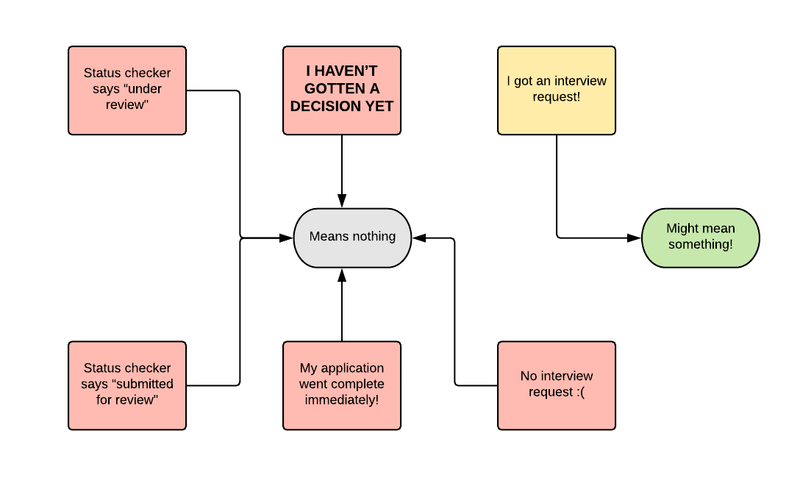 So what does an interview request mean? Sometimes an interview is a prelude to an offer (assuming you don’t come across as a jerk), but other times, an interview is a chance for the admissions committee to get a better sense of your personality or to ask you a question about your application. The only thing you can conclude for sure is that you’re a competitive applicant, one whom the admissions committee is considering seriously. You can learn about how to prepare for interviews here: https://7sage.com/admissions/lesson/law-school-interviews/. Should I contact the admissions office while I’m waiting? Don’t hesitate to contact the schools you applied to if you have relevant updates—new grades, a new LSAT score, or a new job. This is true even though a school will be notified by LSAC of a new transcript or LSAT score: use the opportunity to reach out and reiterate your interest. You can also reiterate your interest if you haven’t heard from a school by mid-February (see our explanation of LOCIs). Finally, if you find a non-minor typo in one of your attachments, we recommend that you send an updated version. (But for heaven’s sake, proofread carefully before you submit the new version.) The downside of sending a second essay is smaller than the downside of a reader noticing the mistake. Don’t worry about bothering the admissions office, either; if you send an updated essay, your email will probably be processed by someone on the school’s administrative staff who handles many such updates.